This airport course was a major stop on the east coast circuit in the 1950s. From contributor Dave Williams: "Penske and Hansgen won at Cumberland in Cunningham entered cars and in Penske's own later cars. Shelby (in a Maserati "Birdcage") and Mark Donahue (in an Elva Courier) won here as well. We are in our third year of "revival" programming at the airport and hope to bring wheel-to-wheel vintage racing here during the Summer of 2006." "This is May 19, 1957. 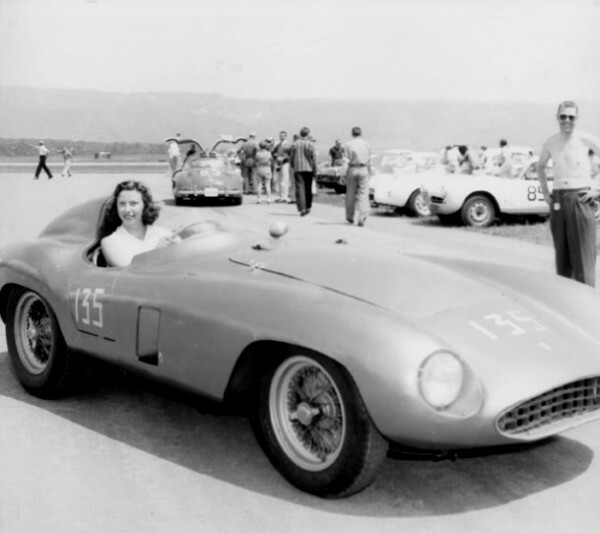 Peggy McClure is seen here in Monza 0552. She finished 4th in the ladies race. Peg McClure was the girlfriend of Ed Gelder. They later married . She is still alive and I have been meaning to contact her, but have never gotten around to it." "You've gotten us thinking about Ferrari's in Cumberland. Could this be Ed Gelder and the Mrs. a few years later in 1960?" "This is exciting. I have Gelder entering a "Monza" at Cumberland in 1960, but as a "3.5." At this time Gelder owned 0684, but it is a 3.7 and not a Monza anyway. Later Gelder races a Monza/Corvette" and I have one crummy photo and cannot figure out the car. 0684 never lost its motor. I really need to see this car from the front. I am working on the theory that Gelder may have owned the 860 Monza 0602, because it is "missing" after 1958 and it was a 3.5. From the rear I do not see twin exhaust pipes so this is not a V12 (i.e. 0684), but is it 0552 or an 860 Monza? David Seielstad continues re: Ed Gelder's Ferrari (s). "The 1960 car is 0552. The big question now is what engine was it using? In 1960-61 Gelder entered in CM as a 3.5. Later he enters a Ferrari/Chevy (same car?) then makes one last appearance at Kent Fields in 1964 with a Monza 3.5. In between in 1960 he enters his 315 at Elkhart and Watkins but does not show. He does race 0684 at Nassau in 1960 then it is back to the Ferrari/Chevy. So a big mystery." 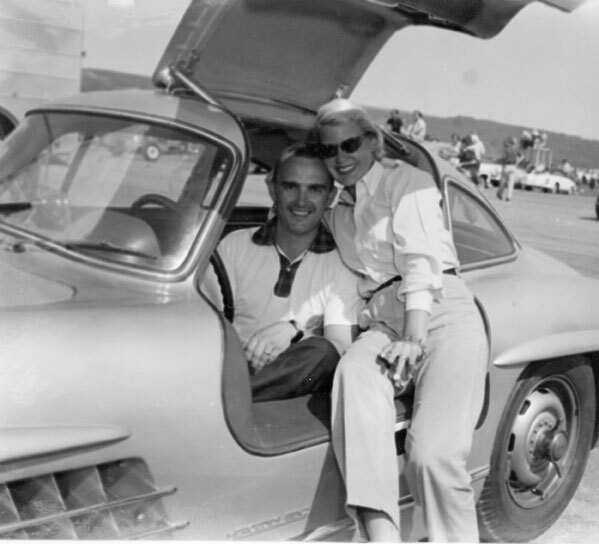 Paul O'Shea behind the wheel of a Mercedes-Bennz 300SL "Gullwing" coupe at Cumberland. Dave Williams didn't identify the lady. East coast racing personalities Donna Mae Mims and Don Yenko were very popular with local fans. 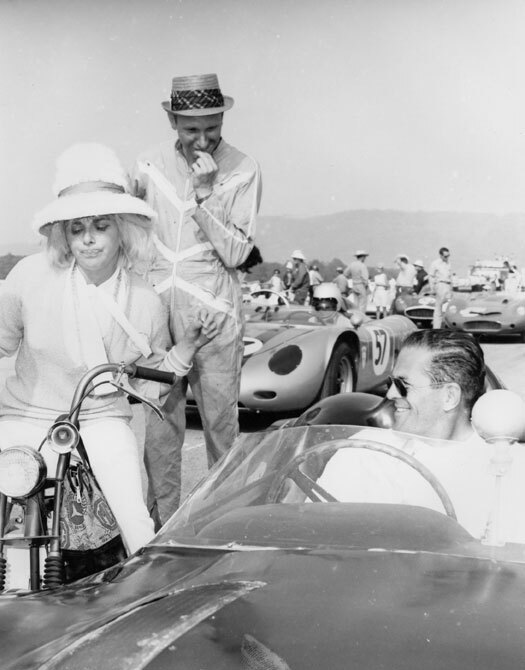 Here they visit with east coast Lola driver Dr. MRJ Wylie on the Cumberland grid in 1964. "One small correction in your old historical page: The Cumberland MD photos are identified as “Cumberland, MA” which would be Massachusetts. Small thing. But, back to the Cumberland races (and Donna Mae Mims). The races were identified as the “Cumberland races” because they were held at the airport by that name. Here’s the catch: the City of Cumberland, Maryland is situated on sharp hills and deep gullies (its coal mining country). The Potomac River is the southern boundary. There is no way one can build an airport on the Maryland side of the river. Therefore, the Cumberland airport is situated among farmland and rolling hills on the other side of the river – in West Virginia! Only an ex-San Franciscan who has lived in West Virginia could catch that." Back to: Gary Enoch's H-Mod Photos!